The state weather agency forecast more rain accompanied by strong wind and lightning throughout Wednesday and Thursday, following heavy rains that pounded several parts of the country Tuesday. A 49 –year-old man was killed and two others injured in flash flooding caused by an unexpected downpour that hit Seoul, police said Wednesday. The flash flood occurred on the Jungnangcheon, a tributary to the Han River that flows through northeastern Seoul. Police restricted entry to the Dongbu Expressway, which follows the Jungnangcheon, at 8 p.m. on Tuesday, due to flooding that left parts of it 3 meters underwater. 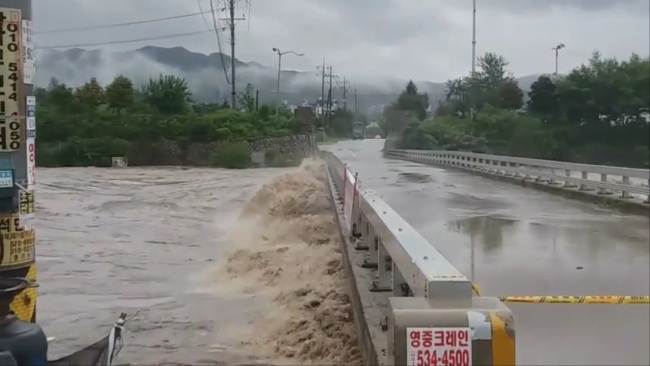 Police said the man who died was found near a flooded bridge in Nowon, northern Seoul, early Wednesday, three hours after a search for him began. His family had reported him missing Tuesday night. Police are investigating if the victim had entered the area before the restriction or his body had floated there from a nearby area. A 38-year-old woman and a 64-year-old woman were rescued after they were found trapped in one of the five cars partially submerged in water and were transferred to a nearby hospital. From midnight until 9 a.m. Wednesday, Eunpyeong district of Seoul recorded over 172 millimeters of rain while the northern districts of Dobong and Nowon recorded 124.5 mm. The Jongno district in central Seoul recorded 97 mm. The Korea Meteorological Administration issued heavy rain warnings in northern Gyeonggi Province and northern Gangwon Province, as over 50 millimeters of rain per hour hit the regions, along with lightning and thunder. Some areas saw heavy rain of over 400 mm. By 3 p.m. on Wednesday, Yeoncheon in Gyeonggi Province recorded 439 mm, while Cheorwon, Gangwon Province, recorded 431 mm. As of Wednesday afternoon, 379 trekking paths in 13 national parks were closed and nine bridges and underpasses were blocked in Seoul, Daejeon and Gyeonggi and Gangwon provinces. Authorities also warned of the potential for landslides in areas adjacent to mountains. Landslide warnings have been issued in areas in Incheon and Gyeonggi Province, including Paju and Dongducheon. 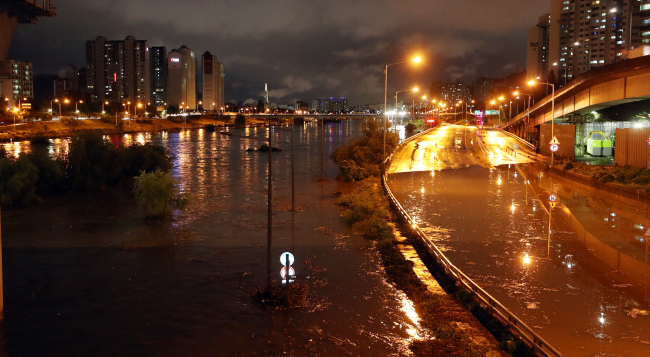 Across the nation, 61 people from 41 households evacuated their homes and sought refuge in community centers, while over 764 buildings were damaged from the flooding in Seoul, Incheon, Daejeon and Gyeonggi Province.